Netherlands cyclist Tom Dumoulin took a high-tech route when preparing for this year’s Tour de France bicycle race. Besides the strenuous physical training, Dumoulin also collaborated with the Netherlands’ best and brightest scientists to shave seconds off his time. His secret weapon? 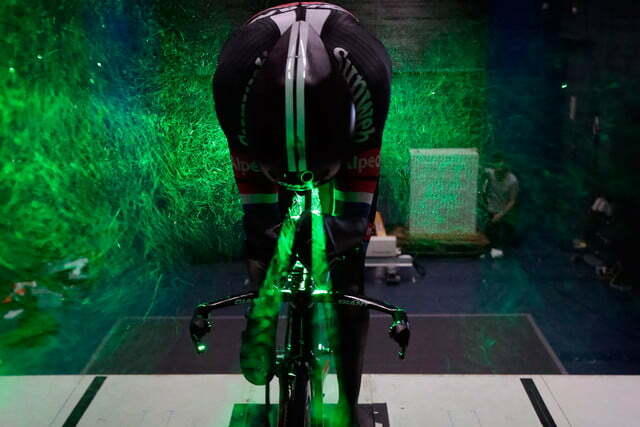 A high-tech, aerodynamic skinsuit optimized using 3D printing and wind tunnel technology. When looking at ways to improve his times, Dumoulin and the experts on his Team Giant-Alpecin decided to focus on improving the bodysuit he wears during time trials. “Research has shown that the composition and structure of the fabric in a cycling suit have a significant influence on resistance and drag, important for us to start exploring how to further improve our time trial suit,” said Team Giant-Alpecin’s Teun van Erp. To design the cutting-edge skinsuit, the team worked with clothing partner Etxeondo and employed the resources of a team of scientists at Netherlands’ Delft University of Technology (TU Delft). 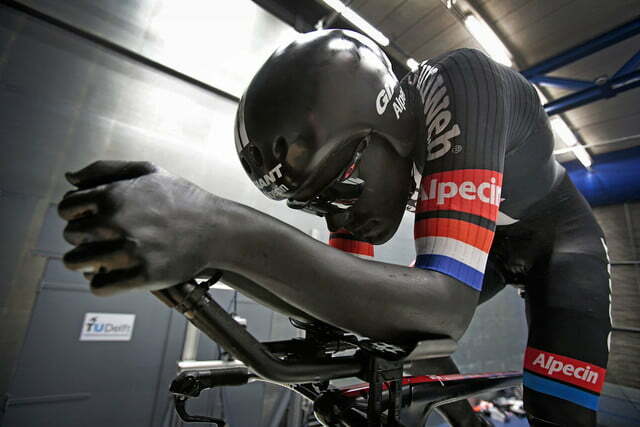 The researchers at TU Delft began the bodysuit development by scanning Dumoulin’s body while he was riding his bike. The team employed the services of photography experts th3rd, who simultaneously captured images of Dumoulin’s body using more than 150 DSLR cameras positioned at many different angles. It took 30 minutes of Dumoulin’s time to collect the data necessary for the next step in the process — a 3D-printed mannequin of Dumoulin on his bike. The team used a standard 3D printer and the fused deposition modeling method to print a model version of Dumoulin. The team built the model in eight different parts and attached them together using pin-and-hole joints. This construction allowed the researchers to manipulate the 3D mannequin and change the bodysuit as needed. Altogether, it took approximately 50 hours to print the replica. Once the mannequin was ready. The TU Delft team outfitted the mannequin with different bodysuits and placed the 3D-printed model into the wind tunnel. Each bodysuit was examined for its ability to reduce drag while riding. The team found that the best suit contains both rough and smooth areas, which combined lowered the drag by a half percent. For a cyclist, this reduction could translate into a few extra seconds, which could mean the different between a win and second-place finish. This project is one of many between Team Giant-Alpecin and TU Delft, which announced a multiyear collaboration earlier this year. 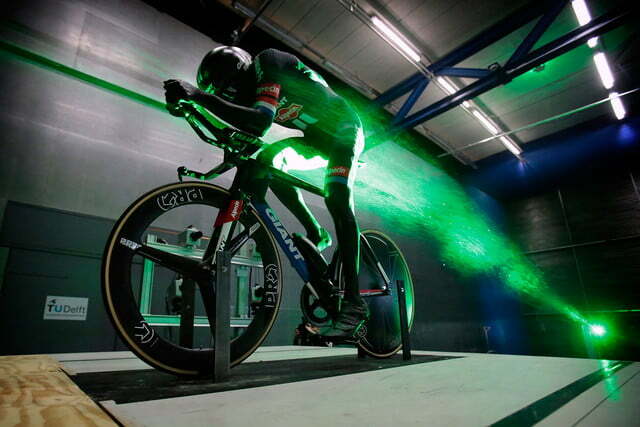 They are working on a sensor-filled bicycle, aerodynamics, data analysis, and more. So how did Dumoulin do on the Stage 13 time trial while wearing his cutting-edge skinsuit? He won that day’s stage, beating out Tour de France leader Chris Froome by 1 minute and 3 seconds.